Android Pie 9.0 for Redmi Note 3 is now available to download from a highly unstable test build. It is not recommended for everyone to install but you can try if you want to see how Android Pie runs on Redmi Note 3 (kenzo). This AOSP build of Android Pie 9.0 for Redmi Note 3 is brought to you by #ROHAN and yet another build is by Lne. THIS BUILD MAY NOT BOOT AT ALL. THIS IS AN INITIAL TEST BUILD OF Redmi Note 3 ANDROID PIE (Android 9). MAKE SURE TO BACKUP EVERYTHING BEFORE YOU INSTALL THIS ANDROID PIE ROM ON Redmi Note 3. – Installing a custom ROM requires unlocked bootloader on Redmi Note 3, which may VOID your warranty and may delete all your data. Before proceeding further you may consider backup all data on the phone. – You are the only person making changes to your phone and I cannot be held responsible for the mistakes done by you. – Here is the how to install TWRP for Redmi Note 3. – This recovery guide requires an unlock bootloader on Redmi Note 3. – Try to avoid restoring apps backup using any application such as: Titanium Backup. It may break things up. Boot into the TWRP custom Recovery to install this Android 9.0 Pie for Redmi Note 3. Wipe the data partition (or do a factory reset), wipe cache, ART or Dalvik cache and Format the System partition. Download and Copy the Android Pie GApps and Redmi Note 3 Android 9 Pie AOSP ROM ZIP files to your phone by using MTP mode in TWRP. Flash the Redmi Note 3 Android 9 Pie AOSP ROM file that you have copied into the phone. Then flash the Android 9.0 Pie GApps (Android 9 Pie GApps package). Reboot and Enjoy the Android 9.0 Pie on Redmi Note 3. 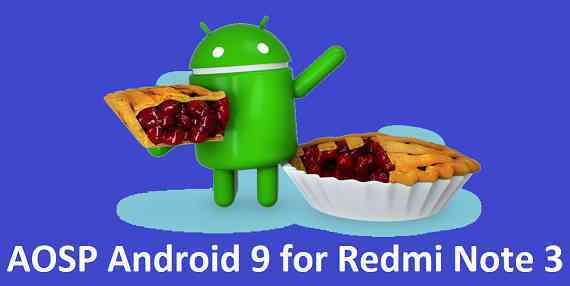 Copy the latest Android 9 Pie for Redmi Note 3 ROM ZIP file, Android 9 Pie GApps package to the phone. Boot into TWRP Recovery on Redmi Note 3. – Make sure you have a latest custom Recovery that should be able to flash the Android Pie ROM update on Redmi Note 3. First install the Android 9 Pie ROM ZIP file from device. Reboot and see you have the GApps available or not. If you don’t have GApps after upgrading the Android 9 Pie on Redmi Note 3, then flash the Android GApps once again. Once everything is done, reboot and Enjoy the Android 9 Pie for Redmi Note 3. Stay tuned or Subscribe to the Redmi Note 3 (kenzo) forum for Android 9 Pie ROMs, Lineage OS 16 ROM, Android Oreo 8.1 ROMs, LineageOS 15.1 ROMs, other ROMs and all other device specific topics.